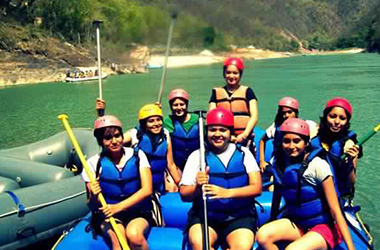 Real Adventure Guru is building adventure packages for School children and Kids. These programs main aim is to boost child's self-confidence and developing effective relationships through a varied curriculum of fun, games and activities. We arrange camps in which children not only enjoy but also learn interesting activities which can teach them Environmental preservation, Team Building, Healthy exercises and many more knowledgeable activities. These trips give young minds a twist to enhance their extra circular activities as they travel into real adventure where they get to have fun, learn and have the time of their lives. 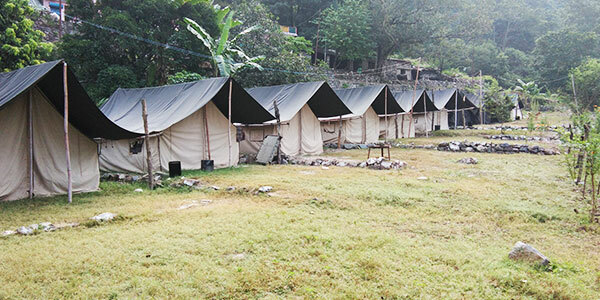 Our camp is safe for everybody and completely packed with facilities like each camp is furnished with 3 beds, proper electricity, Fan and attached toilet. During your stay we offer hot buffet meals that are cooked in our camp kitchen. Back to camp and relax, tea, in the evening bonfire with snacks followed by music competition, dinner and overnight stay. Day 02: Wakeup calls in the morning, fresh up, tea, beach volleyball, breakfast, lecture for rock climbing, proceed for rock climbing base and back to camp, relax and lunch. Second half of the day rappelling and water body surfing. 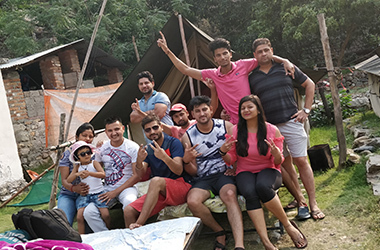 In the evening bonfire with snacks and accordingly plan can be settled for other amusement, dinner and overnight stay in tent. Day 03: Camp Morning: Early wakeup with tea, badminton/beach volleyball, hot breakfast. Activities: Trekking for Chandpur village, little relax, prepare lunch for all, and install tents, interaction with the villagers and their traditions. 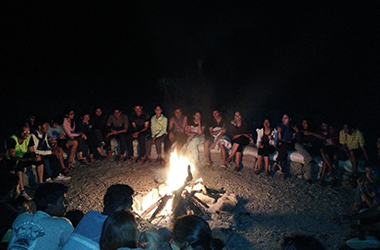 In the evening bonfire followed by traditional music such as Dhol & Damao, dinner and overnight stay at village in tent. Day 04: Wakeup call in the morning, tea, pack up for base camp, rest and breakfast at camp. Activities: Jummaring, move for lunch, relax, proceed for rope course such as Wild Woolsey, Swinging log, Burma loop, bonfire in an evening with snacks, music competition, dinner and overnight stay. 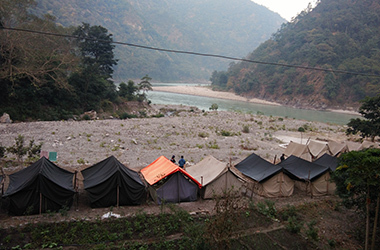 Day 05: Camp Morning: Wakeup call with tea, breakfast pack up for 16kms River rafting from Shivpuri to Rishikesh. Day 01: Arrival at camp about 11am, welcome tea/soft drinks, relax and lunch. 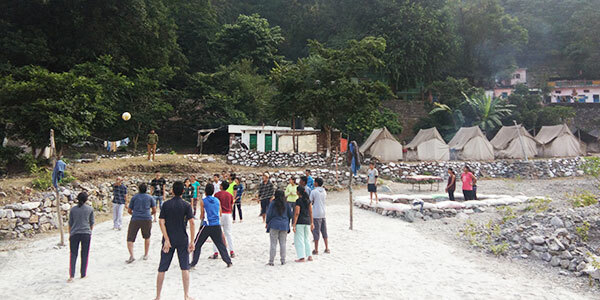 Activities: Body surfing, waterfall trek, back to base camp, tea, volleyball/badminton, in an evening bonfire, dinner and overnight stay in camp. 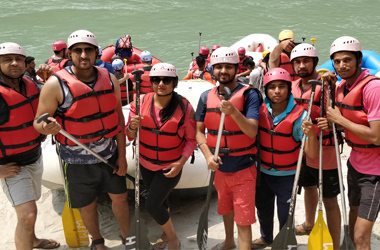 Day 02: Early morning breakfast, proceed for 15 kms River rafting from Devprayag to base camp at Mahadev Chatti, Kaudiyala, lunch in the camp, relax, evening tea, beach volleyball, in an evening bonfire, dinner and overnight stay. 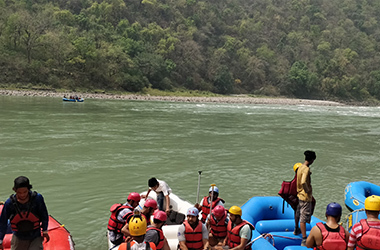 Day 03: Weak up call, tea, breakfast, proceed for 8kms River rafting from Marin Drive to Shivpuri, return to base camp, lunch, relax, bonfire in an evening, dinner and overnight stay. Day 04: Early morning breakfast, pack up, proceed for 16kms River rafting from Shivpuri to Rishikesh.